Madison, Wisconsin is getting ready to celebrate the unveiling of a first-of-its-kind art installation that will put the midwestern city on the world map for landmark innovation. On Thursday, Nov. 10 from 5-7 p.m., the downtown networking event, New Places, New Faces will be hosted by Downtown Madison Inc., Hovde Properties and award winning mosaic artist Jonathan Brown, to reveal a giant waterfall mural installed with LED lights running the entire height of the 10-story historic building located at 316 W. Washington Ave.
“Madison is on the map,” Jonathan Brown tells AXS, excited about Thursday’s event. While Brown and his Houston based company, Modern Mosaics Inc., has already captured national attention for a long list of landmark installations across the U.S., he considers this project to be a significant mark of what art and technology can create together. “Rather than just a large-scale mural, I really wanted to give Madison something different. 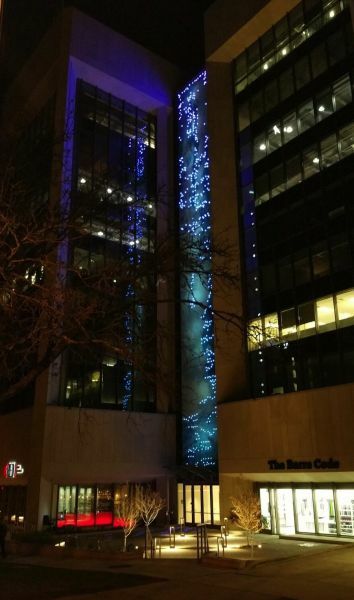 I think an illuminated running waterfall makes a strong statement about the city’s future and its booming technology sector,” he says. The former AT&T building had become an eyesore to Madison’s downtown decor with its rundown condition and bleak beige façade. Then in 2014, Eric Hovde (who ran for Wisconsin’s Senator elect in 2012 and the current owner of Hovde Properties), purchased the building with a vision to completely revamp the downtown landmark into a hip technology infused space. At first the plan was to replace the institution like exterior with sheeny glass and windows, add on a new plaza out front, add space for a restaurant in each tower and completely renovate the building’s interior to attract new tenants. However as the project neared completion in the summer of 2015, Hovde realized the building needed something more. Something significant that would not only bring new life to the building itself, but also new inspiration to the city as well. He enlisted CODAWorx, (a concierge network for commission artists) to put out a call for submissions from artists across the US and after receiving 375 entries; they decided Jonathan Brown was the one for the job. When Brown and Hovde met, it was the magic of two innovators from different fields joining forces and bringing a vision to life. “It was actually Eric's idea to create a waterfall and we started planning it out as a static painted waterfall mural placed between the two towers on the face of the building,” Brown says. Pushing the concept even further, Brown then designed an arched glass splash pond awning that opens onto the building’s plaza and extends from the bottom of the mural waterfall. While an actual water fountain is set to be installed on the plaza ground in the summer of 2017, Brown wanted to take the Waterfall Mural to a whole other level and really bring the building to life. “Of course it’s one thing to paint a mural and a whole other thing to make it move, so we teamed up with Dan Nichols of Starlite Productions to make the magic happen. He designed a controlled lighting system with 500 LED nodes within the mural itself to create the illusion of water in motion,” Brown says. With this concept of using light as moving water, Brown then explains how the system is programmed to make it appear as though water falls from the top lip of the building down the mural, hits the colored glass awning, blacks out for a second and then trickles out to the street. “The lights are also in a full spectrum of colors to give the mural an ever-changing look for each season and celebration. Whether it’s red and green for the Holiday season, red and white for the Badgers or green for the Packers, the building will bring a celebratory glow to the entire downtown core. The full system also has 15 theatrical styled exterior spotlights to enhance the illusion of water in motion and several two inch long LED strips in the ground of the entry area,” he adds. Over the course of project, Brown and his team of artists have collaborated with 11 different businesses (including six from Madison) to complete the installation down to every intricate detail. Now after 16 months of hard work and an endless maze of logistical hurdles, the Waterfall Mural is everything Hovde and Brown hoped it would be and they’re ready to light up the city at Thursday’s event. “This is definitely one of the most exciting projects I could hope for as a commission artist,” Brown says. “But I’m also really excited for the city of Madison. Throughout the time I’ve been here working on the installation, I’ve talked to a lot of people in the area who have been telling me about how the building was in a state of disrepair for years. It is anything but that now." 5-7 pm on Thursday, Nov. 10, 2016. 316 W. Washington Ave, Madison WI.